Essential tremor is the most common form of all movement disorders. Generally, essential tremor is where there is a tremor in the arms that is present without other neurological symptoms or signs. Essential tremor becomes more common with increasing age. Essential tremor often runs in families and begins in adulthood, however, it can affect children and people with no family history of the condition. The exact causes of essential tremor are unknown but a combination of ageing, environment and genetics are thought to play a role. The primary symptoms of essential tremor are rhythmic shaking, particularly of the hands but also of other body parts and the voice. The tremor is usually related to specific postures or actions, such as stretching the arms or performing certain tasks including writing. Unlike Parkinson’s disease where the tremor may be present at rest, this is not usually the case with essential tremor. Initially, the tremor may only be present in one hand or arm, but over time it will usually affect both sides. Some people with essential tremor may also have a head tremor and it is common for the tremor to become worse when the person is feeling tired or stressed. Some medications or other illnesses may produce symptoms that are very similar to essential tremor, and so initially your doctor will ask questions to work out if this could be causing the tremor. A diagnosis of essential tremor is only made once all other possible causes are ruled out. There are a range of treatments available to reduce the symptoms of essential tremor. These include medications and surgical procedures such as deep brain stimulation. Simple lifestyle changes including exercise and avoiding caffeine can help some people experiencing essential tremor. 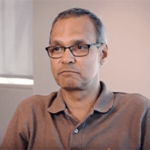 Dr Julian Rodrigues is a neurologist with specialist experience in treating movement disorders such as essential tremor, particularly using deep brain stimulation. To discuss essential tremor treatments and cost, please contact our office.